and Assistant Mistress Jobs in various English Medium Government High Madrasah of West Bengal State. Currently WBPSC Assistant Master and Assistant Mistress Jobs vacancies available in six subjects of Bengali, Arabic, Mathematics, Physics/Chemistry, English and Geography. 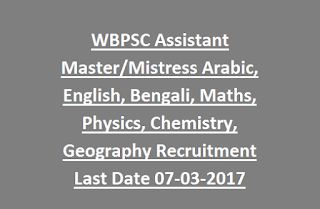 Those who are able read, write and Speak Bengali they are eligible to apply for this WBPSC Madrasah Assistant Master and Assistant Mistress vacancies. WBPSC Assistant Master and Assistant Mistress Selection will be held based on written test and interview. 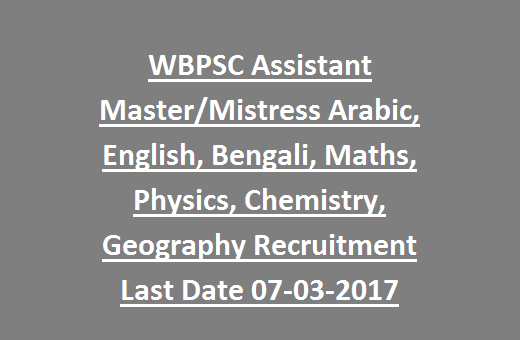 Candidate must have ability to teach in English for this WBPSC Madrasah Assistant Master/Mistress Jobs Recruitment 2017. There are total 72 vacancies available in this current recruitment Assistant Master/Mistress Jobs of WBPSC. Applications for this West Bengal PSC Government High Madrasah Assistant Master/Mistress will be received through online mode only. Offline mode of application form submission will not be accepted by WBPSC. Application have to submit through official website of PSCWB @ www.pscwbonline.gov.in. Online applications will be closed on 07-03-2017. For more details see the below given information. There are total 72 vacancies available in West Bengal Government High Madrasah Recruitment 2017. As on 01-01-2017 candidates should be crossed 32 years of age and should have crossed 21 years of age. →A second class Honours or Second Class Masters Degree in English/Maths/Physics/Chemistry/Geography/Bengali or Kamil (Aliah University) for Arabic Assistant Master/Mistress vacancies. →Should have qualified B.Ed from a recognized university and must have qualified TET Part II. → Should be able to teach in English Medium. Candidates have to pay Rs.160/- through online using credit or debit or internet banking or offline using chalan. No fee for SC/ST/PWD candidates. Selection for Assistant Master and Assistant Mistress jobs will be based on Candidates previous work experience and Interview. If required a screening test will be conducted. Application form will be received through online only via the official website of PSCWB @ www.pscwbonline.gov.in. Update all the required information and submit the application form online. Last date for submission of application form online is 07-03-2017.